Only the sky is the limit, when it comes to what you and Caterworld can do together in making your event or party perfect. Please contact us with any and all questions. Caterworld is a catering equipment rental company located in the Algarve, Portugal. At Caterworld we do not believe in a single recipe for success; we believe in designing a new experience for every event. We specialise in making your celebration an unforgettable wedding, birthday or simply a party. 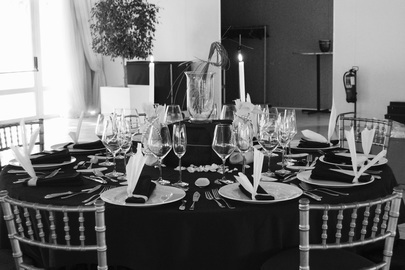 We combine detail with design to achieve a well-decorated party. We ensure to meet all of our clients' desires in a productive way by fusing passion with efficiency. Caterworld combines your ideas and wishes with strategically developed plans in order to ensure that your event is original and unique. At Caterworld you can hire the perfect catering material to complete your party. From the initial idea to the actual day of the party, we are there every step of the way. Picking out the right party equipment can be overwhelming as there is so much to choose from; tables, chairs, linen, cutlery and the list goes on and on. This is where we come in. When you are looking to rent event material, we are there to deliver high quality party material to your door. Specialized in state-of-the-art equipment, the majority of our glasses and porcelain is Vista Alegre, leading porcelain manufacturer in Portugal. Vista Alegre received the Superbrands award in 2014. We also rent glasses from the distinguished Schott-Zwiesel and porcelain from the renown Schönwald. The plates we rent are either round or square and come in various sizes. When it comes to cutlery you can choose between our first-rate Vista Alegre line or the beautiful "baguette" line – the choice is yours. We are flexible and are able to meet any and all of your requirements since we offer a huge variety of event equipment for rent. You can choose between cotton or linen tablecloths with matching napkins in a variety of colours. Our colours include white cotton, black and beige linen. We have linen designed for both round and rectangular tables as well as cocktail tables. You can choose our chaivari lime-wash chairs made out of bamboo that go well with our pearl cushions. Or if you are interested in a particular chair or simply want something different we can get it for you. Top off your event with our vast assortment of party decorations. You can choose between renting our line of table crystals, tea-light holders, hurricane lamps, floating wax spheres, and much, much more. Caterworld believes in taking care of its customers from start to finish. Therefore, we offer high quality party supplies, which are of the highest standard since they go through a careful and detailed treatment process. Naturally, hygiene is of maximum standard throughout the entire process. First we wash the material including plates, cutlery and glasses in our industrial dishwasher. Thereafter, we verify that all our equipment is in perfect condition for future parties. Thirdly, we polish our supplies with jewelers' gloves on to ensure both maximum hygiene as well as shine. At this point we are ready to pack your event's supplies in sealed packages and containers and deliver them to your doorstep.